Welcome to Journey Thru Grief. Journey Thru Grief is a personal account of what I have learned thru my experiences of grieving the lost of loved ones. I hope to be able to share how I am surviving widowhood and the personal strengths I have found within me. On the About Me page, the "doorway" to my site, I'll introduce myself and talk about the reasons for wanting to share my experiences. If my site gives even one person hope and inspiration to see the light and love, then my efforts in developing and sharing this site was worth it. 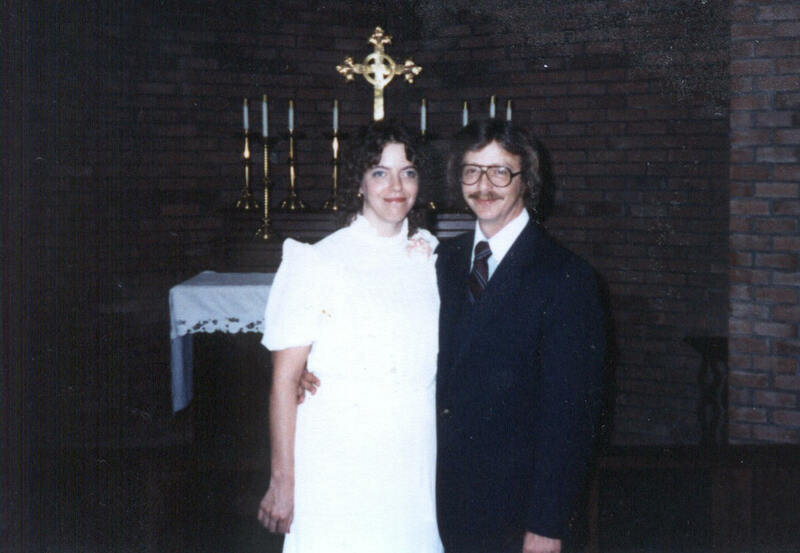 Jerry and I were married in a small ceremony in a small chapel. This is one of the few wedding photos that was taken. One year, he ran out of ideas so this picture showed up on a mug. PSYCHIC GIFTS - As of 5/8/06, I am now doing "readings" at Keen.com. I'm still not totally comfortable with my mediumship skills as I don't connect well with our loved ones, on demand. However, I am now offering Angel Oracle readings both live and by email. The Angels offer wonderful guidance in all avenues of life. Find my link and give it a try. WEBRINGS - 04/07/02 A new page has been added to this site to include the Webrings I belong to. Please be sure to check them out as they do have alot to offer. E-CARDS - New section added 01/25/02. Ok, I love sending cards to family & friends and now I can, along with you. And, the best part is, they are free. I may have to move that page at a later date to add some of my own designs but when that occurrs, you won't notice much of a difference. Enjoy! AFTER-LIFE - New section added 01/20/02. It contains my feelings & thoughts on life of our loved ones after death. Check back often as I continue to post my experiences and add new areas. Please sign my GuestBook so I know you were here.